Kathy and Becky channel their bond of sisterhood to tell this riveting, sweeping tale of two sisters. 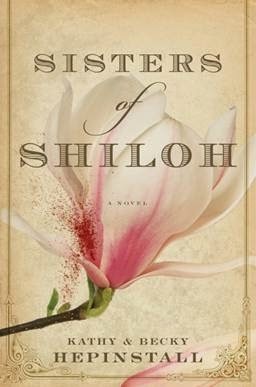 Already an established novelist Kathy enlisted her younger sister, Becky, for inspiration to write SISTERS OF SHILOH. Becky, a devoted military wife and history buff, had always been fascinated by the unsung heroes of the Civil War: women. 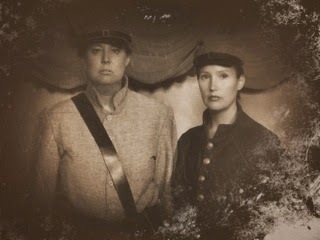 Together, Kathy and Becky conducted extensive research on-site at battlegrounds across Virginia (Winchester, Antietam, Chancellorsville, Fredericksburg, and more), and traded early drafts to help bring the voices of each sister in the novel to life. “The very best historical fiction delivers us into another time and place. “SISTERS OF SHILOH is an unsparing, bloody, emotional tour-de-force. A tale of love and hate, vengeance and devotion, and the darkest secrets imaginable. My very favorite genre to read is Historical Fiction, so I am super excited to have received an advance copy of this book - I will let you know what I think about it when I'm finished with it! I am also very excited that the authors have allowed Pink Lemonade to share the first two chapters of the book with you right here!!! out across his gray jacket. She was exhausted from the march, and the sight of him no longer caused the shock and dread of the earlier encounters. She had resolved that there must be a realm, when the fractions of night and fog reached some magical equation, where the living and the dead could coexist. Arden, though, had grown increasingly moody and demanding. “How many have you killed?” he asked. Her fingers shook as she counted them. She had known the answer at noon but had forgotten it with the coming of dusk. “I’m trying, Arden.” She looked at the blood spreading over his shirt. their sanctuary, taking refuge from everything: the yelps of children during tooth extractions, the peskiness of a little brother, the swift, severe gaze of a mother, general pangs, harsh sunlight, and chores. The other children in town courted the affections of Libby, but she preferred the sweet mixture of orchard and sister, all that shade and adoration. When Josephine was thirteen, a shadow trespassed on that filtered light. The family next door had moved from a small town near Fredericksburg called Shiloh, a young couple with three sons. The oldest was named Arden. He came strutting into the yard on a warm spring day, when the leaves in the orchard were curling tendrils, and the shadows hung dark, waiting for May to darken them into the black of an Angus bull. He wore a pair of corduroys and a shirt with a Western design; his hair was almost as light as Libby’s and his face just as angular. His eyes gave off different inferences that depended on the angle of approach. Libby saw wildness and sweetness and a deep capacity for sorrow. Josephine saw arrogance and entitlement and a lack of respect for elder sisters. Soon Arden’s feet were swinging from the branches, and the quality of conversation was forced into a different season, one that incorporated boys. Now Indian talk pierced the orchard, fishing lore, legends, and brutal accounts of cats killing birds. Pirate stories and secret caves, the challenge of breaking a colt. Even the drifting scent changed from the faint lavender of girls to the sweat of a hot boy. Something was unnatural here, like a tree that fruits before it blooms. Josephine was gently elbowed out of the shade until she no longer entered the orchard at all but lurked at the perimeter. She didn’t understand how to be alone. She felt insubstantial, impermanent as silence in a room full of women. There was some kind of secret to making friends, and, denied this, she began to spend her time in her father’s office. Children cried and teeth flew. “Hand me the laudanum,” her father said. She watched him pour the opiate onto a spoon to numb a patient’s pain. She imagined the bottle held to her own lips, pain declining, pleasure growing. The sweetness of a watermelon, the dreaminess of a summer afternoon, the cool water of a fishing hole, the softness of ferns. Hostility toward the whole led to belligerence about the parts. His laugh. His haircut. The shape of his arms. The blue of his eyes. The way his pretty face resembled Libby’s. When Libby and Arden weren’t in the orchard, they would disappear into the woods and stay gone for hours, returning with new secrets, certain stories exchanged, pebbles gathered, sparrow eggs rescued, snakes slain. The sight of the interloper drove Josephine to distraction. She had nightmares in which he fell from the branch of a tree or from the top of their house, grasping her sister’s hand and pulling her down with him. A year had passed. Autumn had arrived. The apples were heavy in the orchard, weighing down the limbs. Flowering weeds turned colors or withdrew their blooms. The sky was white in places, sweet blue in others. Libby’s illness began as a weariness, a desire for naps. Quickly it grew a fever, then chills. The orchard sat empty. Libby lay in a dim room, her face flushed and skin perspiring. Arden visited her at first, but when she grew worse, he could not look at her without bursting into tears, and Mrs. Beale sent him away. Despite the protestations of her mother, it was Josephine who took over, fetching teas and applying poultices, whispering, singing, telling her own tales, finally. She wiped down the floors with lavender water so that Libby could awaken to the fragrance of flowers. She brewed tea, heated soup on the fire in the kitchen. Her nursing skills defined her, made her whole again. A framed tintype sat on the night table. Two little girls stared out from it, one with golden hair and the other with bright eyes and a contented smile. Their father had taken them down to the studio at the Taylor Hotel as a birthday present for Josephine a few years earlier. She couldn’t help staring at it now and remembering those days when Libby was healthy and belonged to her. They would speak to each other, sister to sister, Libby’s voice dreamy and hot, a breeze coming through the open window, a pail of water on the nightstand, a gingham cloth dripping water on the floor. “Hold still,” Josephine said, as she applied the compress. No sign of Arden, whom their mother would not let back in the house. Apples fell, too ripe now for eating. One day the chickens got loose and spent the day in the orchard, eating the bruised flesh. Crows came to that harvest, as did raccoons and deer. The corn had ripened. Stephen, the lazy younger brother, was supposed to have gathered the ears but spent his time chasing an elusive bullfrog down a winding creek, coming back with his pants wet up to the waist. He slogged into Libby’s room, dripping water on the floor and corrupting the sweet air with the sweaty odor of his body. Whispers from their parents’ room. “She’s not getting any better,” said their mother. Fever moved through Libby’s body. She shook with chills and soaked her sheets with perspiration. Symptoms in opposition and growing further apart, like the views of the North and South. She mumbled things that made no sense. The old doctor came again and stood by her bedside and saw the bad news like everyone else. When he put on his stethoscope, one knob fell out of his big ear and he didn’t seem to notice. He pressed the metal disk against a vein throbbing in her neck. sidled away. Dr. Beale walked with a stiff and singular purpose, dragging the coffin right through the herb garden and between the stables. The horses poked their heads out and watched him disappear into the shed. Mrs. Beale came into the room but didn’t look out the window or at Libby. She searched the room for something neutral, settling on a silver tea strainer that drained brown liquid on a china saucer. in which plants have died, and no amount of lavender could bury the smell. Libby’s dreams grew frantic. She called out sometimes. She saw things in the room that did not include her family. No one knew the exact hour of the fever’s breaking. It happened sometime during the night. Libby woke up that morning mumbling. By afternoon she whispered things that made sense. She had lost weight; her face was gaunt, filled with sickbed shadows. Josephine held her hand. His breath smelled of absinthe. He gathered his bag and left the room, his back stooping. Josephine stood at the end of the bed and watched them play. The cards fanned out, shuffled, flew onto the bed one by one. Arden and Libby studied the cards, then each other. “I’m going now,” Josephine said. He had finally begun to nurse her, now that she was well. Mrs. Beale looked down the table at Libby, her expression tentative and warm. “Arden is so glad to have you back,” she said. Josephine saw them together in the shadows of the orchard. It was dusk. They had been there all day with their secrets and were now emerging, hand in hand. She glided into shadows of her own. By that cover, she watched them kiss. And like something suddenly noticed in the world, a color or a scent, she saw the kisses everywhere. Lightning quick and furtive. Covered in shadows or sheltered by the blinding light of noon, they went unnoticed by the rest of the world. She tried to turn her eyes away, but the kisses seemed attracted by her torment. When she could not see them, she heard them. And when she could nothear them, she imagined them. She wondered if a kiss could live in her own mouth, or if she was broken beyond repair, not a girl or a boy but a ghost, offering nothing to the world but a glow and a rustling. One day, as she was on her way to the dry goods store, at her mother’s orders, to buy a bolt of cloth and some needles, she met Arden coming the other way. His hair was getting long; he needed a haircut. Certainly her father would never let her brother Stephen’s hair grow past his ears. His hair made him look even more girlish with his high cheekbones and delicate brow. They stopped a few feet from one another, no greeting or wave. Just the stare of enemies. “You’ve been spying on us,” he said. The sun was bright overhead. The coins in her hand felt sweaty. His voice was not angry. Just matter-of‑fact. She didn’t answer him. She tried to step around him, but he blocked her path. She went the other way, and he blocked her again. His eyes looked straight at her. There was no one on the road. The statement burned inside her. She wanted to run away, but she knew he would catch her arm. Something about his voice told her he’d been waiting for the right moment to say these hurtful things, and he was going to force her to listen. Josephine felt her face flush and a tiny hole form in her stomach, as though she’d been shot there. The cruelty in the remarks was the cool dispassion and the utter confidence with which they were spoken. It was true, sometimes she felt as though she were invisible, as though people drank in the sight of Libby and that was enough, that her place was in the shadows and her fate to be unseen. She stepped to the side of him and made her way to the store, trembling with rage and shame, the clenched coins digging into the flesh of her hand. How did the idea for the SISTERS OF SHILOH originate? Kathy: “Something seemed so wrenching about girls blooming into mature sexuality who needed to subvert that sexuality and hide their womanly traits in order to fight a man’s war. At first, Libby, the older sister, was avenging the death of their brother. In later drafts, the object of their revenge became Libby’s dead husband. But from the beginning drafts to the end ones, Josephine was fighting only to protect Libby—and how much she was really “fighting” is something explored in the novel. Is the novel based on the story of real life sisters? The novel takes place during the Civil War. What kind of research did you perform? What was it like to write a novel as sisters, about sisters? How was the process of writing the story together different from writing alone?